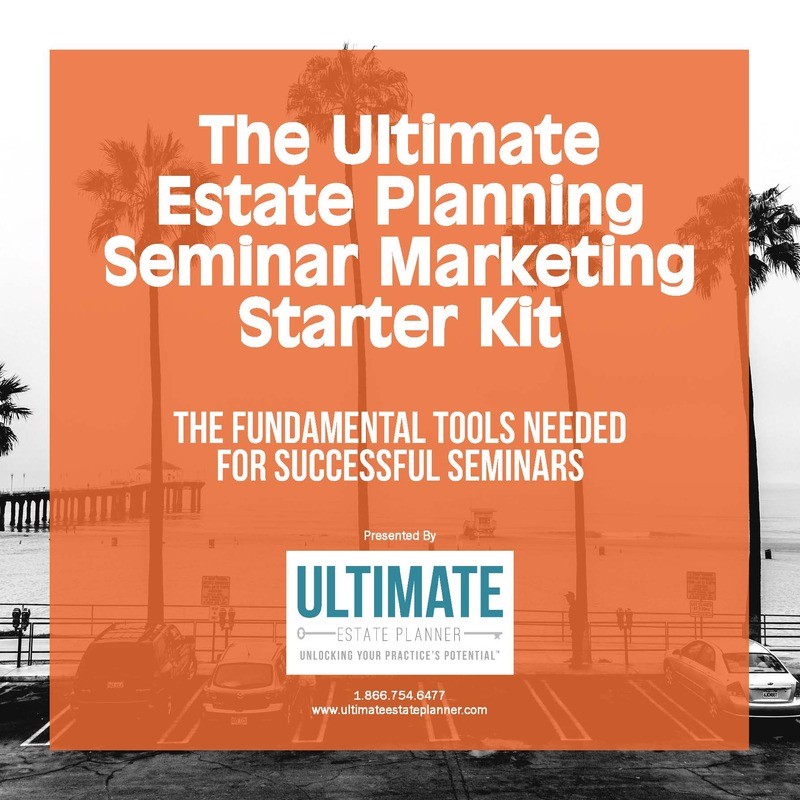 What’s Included in The Ultimate Estate Planning Seminar Starter Kit? The Ultimate Estate Planning Seminar Starter Kit is a bundled package that includes the following individual items. Seminar Marketing Checklist & Timeline – 12-week checklist to use as a guide as to the chronological timeline of the tasks to be done leading up to the seminar. Client Profile – Criteria to determine your ideal client prospect and use to develop a mailing list for your seminars. Site Inspection Report – Checklist to use when inspecting a potential seminar venue. Seminar Marketing Budget – Worksheet to help you plan out your seminar marketing budget, including the costs and return on your investment. Monthly Seminar Cost Analysis – Worksheet to help you track your marketing expenses by analyzing certain criteria and helping you determine where costs can be reduced. 8 Rules for Creating an Effective Marketing Piece – Checklist for evaluating whether your marketing piece meets the 8 rules for an effective marketing piece. Seminar Supplies List – List of supplies needed for the seminar. Seminar Checklist – Checklist of things to be done on the day of and immediately after the seminar, including a packing list of important supplies needed at the seminar. Seminar Reservation Line Script – Script to use for the reservation line when prospects call in from your marketing pieces. Seminar Reservation Form – To write down seminar reservations to be input at a later time onto the database. It can also be used if you take reservations by phone. If you use the form for this purpose, it is important to ask for marketing source information to help you track your marketing’s effectiveness (this is not a scientific way of tracking this information). Seminar Sign-In Sheet – Sign-in sheet used at seminar for any walk-ins. Seminar Confirmation Notecard – Notecard template sent out to seminar attendees prior to the seminar. This example is provided to you for content. You may wish to use a graphic designer to help you put together a more professional confirmation postcard, as you will want to brand this to your law firm and also have nice graphics for driving directions to the seminar venue. Seminar Reminder Confirmation Call Script – Script to use when confirming seminar reservations 2 days prior to the seminar (both for a live person and a voicemail message). Response Form – For seminar attendees to fill out at the end of the seminar. The information can be used for understanding your target market demographics. Discount Certificate – Certificate to incentivize seminar attendees to book appointment before leaving the seminar and only given to people when appointment is booked. Printed on certificate paper, which can be purchased from any office supply store. Appointment Reminder Card – Card used during the appointment booking process at the conclusion of the seminar. These cards should be printed on bright neon-colored cardstock. Appointment Package Coverpage – The appointment package includes a coverpage, which we have included, as well as a questionnaire that you will have a prospect complete before coming in. You should also include directions and/or a map of your office. Handling Objections to Booking an Appointment – Script for handling some of the most common objections that people have to booking an appointment at the seminar. Seminar Follow-Up Script: Attended Seminar, Booked an Appointment – Script used to contact people after the seminar that booked an appointment and confirm their appointment. There’s a script for someone with a Living Trust already and for someone getting a Living Trust for the first time. Seminar Follow-Up Script: Attended Seminar, Did NOT Book an Appointment – Script used to contact people after the seminar that attended, but did not schedule an appointment. These can only be contacted if they turned in a response form. Seminar Follow-Up Script: Seminar No-Show – Script used to follow up with people who made a reservation to attend the seminar, but did not show up. Seminar Follow-Up Script: Appointment Cancellation – Script used when prospects are trying to call in and cancel their appointment. Seminar Follow-Up Script: Appointment Reschedules – Script used when prospect is trying to reschedule their appointment. Seminar Follow-Up Script: Appointment No-Show – Script used for people who do not call in and do not show up for their appointment. Seminar Tracking Form – Form used to help you evaluate your seminar results. Seminar Profit & Loss Worksheet – A spreadsheet to help you calculate the net profits of your seminars. CD (or Flash Drive) with Modifiable Versions of These Forms to help you implement what you’re taught with this guide to lead you to the successful seminar marketing! Seminar Script so that you will know what to say for each and every slide with tested and proven phrases and explanations that motivate prospective clients to want to get their estate planning done and, most importantly, done with your firm! Seminar Marketing Materials featuring five different tested and proven direct mail pieces that have been used to drive interest and attendance to the seminar for both older and younger clients and clients already with living trust and those that are getting a living trust for the first time. Also included are mailing list demographics and instructions on how to utilize newspaper inserts. Seminar Handouts including a seminar outline and response form to help attendees follow along. Also includes other seminar handouts and flyers, along with suggestions for handouts to include. Appointment Booking Tools including appointment cards to help make the appointment scheduling process go over smoothly and efficiently and a discount certificate to help incentivize and motivate people to book their appointment before they leave.